5x 4-1/2x 6-1/4" tall electric cluster of blazingly clear crystals have arranged themselves in starbursts for you from a stable sweet milky quartz base. Rainbows, penetrating points, doubly-terminated crystals, glitter and barnacles, twins. 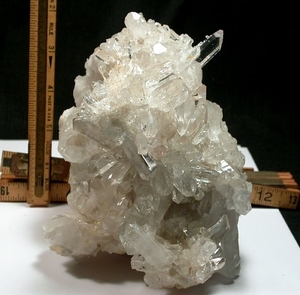 Largest crystal, 3/4x 2-1/2" has a penetrated nose. Still slightly pink [natural clay] from the [closed] Arkansas mine, missing members, chips and regrowth do not detract.